CLEM - ZineWiki - the history and culture of zines, independent media and the small press. 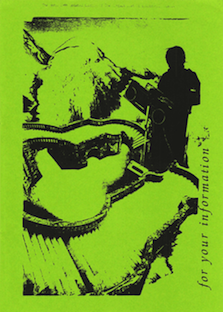 ‎CLEM, an acronym for Contact List of Electronic Music, was a Canadian zine. CLEM was edited by Alex Douglas, and published in Vancouver, British Columbia throughout the 1980s. The first issue appeared in Spring 1981, with Issue 2 following in October 1981. After the first few issues, every May a major booklet was produced and during the year, at a minimum of every 3 months, updates were published. The zine was devoted to compiling and distributing information in support of publications, recordings, radio stations, and organizations related to the promotion of electronic music. It also connected readers to the cassette culture and zine networks of the period. The zine focuses almost solely on music of the electronic persuasion including Progressive Electronic, New Age, Industrial, Noise, Ambient, Collage, and Minimal Wave/Synth. Artwork was contributed by Peter Frohmader, Chris Gibbons, and Robert Vigneault, among others. Writing was by Ken Moore, Blair Petrie, among others. Included were reviews and addresses of publications from around the world, including other zines such as Eurock, and Punk Research. This zine is catalogued and archived in the Bowling Green State University Zine library at the Music Library/Bill Schurk Sound Archives. This page was last modified on 4 December 2018, at 18:09.